Despite Samsung Galaxy S4 and HTC One have achieved a thundering success on the smartphone market, their giant manufactures seem to enthrall the market with compact versions, respectively dubbed as Samsung Galaxy S4 Mini and HTC One Mini, which are promised to let people no longer have their smartphones bulged out of their pockets all the day. Now that Samsung Galaxy S4 Mini and HTC One Mini come in close proximity to each other, it's bound to be compared in details. If you want to have a better understanding of the mid-range spin-off of the two flagships, let's get into the nitty gritty. Through the detailed Samsung Galaxy S4 Mini vs HTC One Mini review, you'll for sure know which one will take the top spot. The Samsung Galaxy S4 Mini resembles very much with its sibling, albeit with a smaller 4.3-inch qHD Super AMOLED screen rather than a 5-inch panel. However, Samsung has given the Mini version with a resolution of 960x720 pixels and a pixel density of 342ppi, which is quite a reduction in the quality for the S4 Mini. Though no official word has gone out on the HTC One Mini, the current industry speculation unveils the info on this mid end smart phone. The HTC One Mini will reportedly pack the same 4.3-inch screen but in a higher resolution of 1280 x 720 pixels and a pixel density of 342ppi, which will be a fatal blow to Samsung in competing for a slice of the miniature handset market as customers are getting used to the high specs. So with its high-end display, the HTC One Mini walks over the course. The Samsung Galaxy S4 Mini runs on a 4.2 JB OS version of Android. The Galaxy S4 Mini is packing a Qualcomm Snapdragon 400 chipset that consists of a dual-core 1.7GHz Krait CPU and an Adreno 305 GPU, as well as 1.5GB RAM. This handset handles multi-tasking with ease, including all the high-end apps that Android Jelly Bean throws at it. Coincidentally, running on the android 4.2.2, Jelly bean, HTC One Mini is expected to use a dual core processor with a beefier 2 GB RAM but a slightly slower 1.4 GHz clock speed. 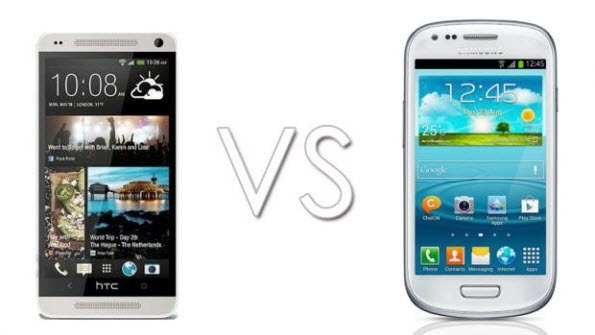 In terms of performance alone, the Samsung Galaxy S4 Mini vs HTC One Mini will be at best a draw. Samsung has loaded Galaxy S4 Mini with 8 GB onboard storage and is equipped with a microSD slot, which is expandable up to 64GB. While HTC One Mini will continue its big brother HTC One with no external storage, but it is expected to have 8 GB or 16 GB variant though not having a microSD slot. So based on the built-in memory, the HTC One Mini wins hands down. but as to the external storage, the Samsung Galaxy S4 Mini will win the storage round. A Li-Ion 1900 mAh battery is carried ong Samsung Galaxy S4 Mini whereas HTC One Mini is rumored to ship with a Li-lon 1700 mAh battery. Both the handsets will not really need mid-day charging. The two handsets are a Roland for an Oliver in Samsung Galaxy S4 Mini vs HTC One Mini review, which will surely make an impact on the mid-range smartphone market. Actually, the battle of the two minis will see no clear victory. Both Samsung Galaxy S4 Mini and HTC One Mini appear to be sound options and offer us a splendid visual experience. So if you have amazing DVD collections and a wealth of video files, never waste the chance of enjoy them on the two mid-tier Android handsets. Tips: To enjoy DVD on Samsung Galaxy S4 Mini and HTC One Mini, please use MacX DVD Ripper Pro to get your movies out of DVD discs and make them movable by ripping DVD to your smartphone without any trouble. 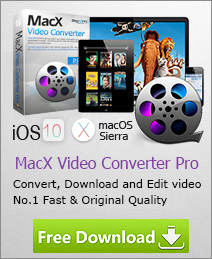 While for video addicts, try MacX Video Converter Pro as it helps you download video from YouTube, convert regular videos like MP4, FLV, AVI, WMV, MOV, HD videos such as MKV, AVCHD, M2TS and other recorded videos to Samsung Galaxy S4 Mini and HTC One Mini viewable format in a fraction of seconds. The tutorial guides you to convert video to Galaxy S4 with the best Samsung Galaxy S4 video converter at lightning speed. So, you can play whatever videos like MTS MKV AVI FLV etc on Samsung Galaxy S4 for on-the-move enjoyment.